This picture and headline was the featured front page story in USA Today on 12 Nov 2012. USA Today – the largest general interest newspaper in the US (the Wall St Journal has a slightly larger circulation but it is more ‘special interest’) ran a major front page headline story on 12 November – you can see their front page photo at the top of this article, and this link takes you to the online version of the story, without the scare picture that jumps out at you from the print edition. Is this a fair balanced coverage of the concept of prepping? I write for a living, and I know all about how the choice of words from a list of apparent synonyms can massively alter the tone of an article. I know how to make an article seem fair but actually be biased. I’m not saying I’m the best at such things, and I seldom use such rhetorical trickery myself, but I know it when I see it used elsewhere. In the case of the USA Today article, the bias leaps off the page at readers. Indeed, it is so prominent that I saw it out of the corner of my eye while walking past a newspaper box on the street. The first bit of bias was their choice of photo. Maybe you think it is really cool to have state of the art gas masks, but surely you’ll also admit that they make the wearer look about as scary/nightmarish/alien as anything ever possibly can do. USA Today could have chosen any type of picture at all of this family. They could have had them all wearing their church-going best clothes, seated on a coach in a family ensemble like some people do for formal family photos. They could have had them standing proudly next to some of their food store in casual clothes. They could have had them outdoors, and so on. But for their ‘hero picture’ the newspaper chose to make the family look as scary and as unusual as people ever can look. Normal people don’t own gas masks, and people who do own gas masks don’t normally wear them (along with the rest of their bio-hazard clothing too). Anyone looking at that picture will feel an immediate sense of rejection and revulsion, and young children may have nightmares for days afterwards. First of all, note what are termed ‘scare quotes’ around the word “prepper”. By putting that word in quotes, there’s an implication that there’s something unusual or artificial about the term, and thereby, something unusual or artificial about people who call themselves preppers. Keep reading. Once you’ve got past the scare quotes on the word prepper, you’ll then be assailed by two more rhetorical devices. The first is the use of the word ‘doomsday’. That’s an emotional term that implies despair, incredible defeat, disaster and suffering, and is attached to concepts like nuclear Armageddon, the movie Dr Strangelove, and crazy people wearing hand-written billboards on street corners. 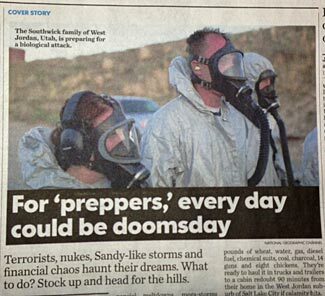 To make the term doomsday even stronger, the headline says that for ‘preppers’, they believe that every day could be doomsday. So the headline uses a term that is far removed from most people’s normal frame of reference and thinking (doomsday) and then tells us that these strange people – ‘preppers’ – worry that every day might be doomsday. Normal people not only seldom/never think about a doomsday type event, but they sure don’t think that every day might be doomsday. So the headline has already broadcast a none-too-subtle message. These ‘prepper’ folks are plain crazy. Add that to the picture that ‘proves’ the headline’s claim, and the reader’s perspective has been massively shifted from open-minded and curious to close-minded and rejecting of prepping before he has even read the first word of the text that follows. Terrorists, nukes, Sandy-like storms and financial chaos haunt their dreams. What to do? Stock up and head for the hills. There’s a bunch more emotionally negative words here. First of all, the story again tells readers that preppers are ‘not like us’, because normal people don’t obsess over terrorists, nukes, massive storms of financial chaos. Second, the phrase ‘haunt their dreams’ shows us two things – first, that this is all a dream-world rather than a reality, and second, a gentle suggestion that preppers are unbalanced, because they have haunted/nightmarish dreams all the time. Now, to ‘prove’ the unbalanced nature, the lede closes with a throwaway dismissive summary of what prepping is all about – the suggestion that preppers not only live a life haunted by baseless fears, but also have an irrational response – to ‘stock up and head for the hills’. The phrase ‘head for the hills’ is another phrase that has a social meaning as being a ‘giving up/running away’ type of action, so now we’re being told that not only are preppers crazy, but also they are defeatist. All of this is of course completely opposite to the reality of who and what we are. We’ve not even started to read the article itself, and already we’ve had our thinking carefully massaged to ensure that we completely reject anything to do with the concept of prepping, and anyone who claims to be a prepper. We’re not going to continue analyzing the actual article itself, but hopefully our look at just the picture, headline and lede has already clearly shown you the biased nature of the article and how it is designed to ridicule preppers and make its readers reject the prepping concepts. Let’s however just quickly look at another way the article could have been handled. First, the picture. A fair treatment of the topic would have the family in a normal type of pose, with normal clothing and normal things – looking like ordinary people, rather than looking like strange and frightening crazy people. The government’s bungled response to Hurricane Sandy and the subsequent problems suffered by millions, are encouraging more and more Americans to learn to look after themselves, no matter what type of disaster they encounter. Do you see the difference? Both approaches introduce the same broad story concept – prepping. But whereas the USA Today treatment did everything to make ‘preppers’ seem like weird strange people beset by irrational fears, and totally unlike normal people, our alternate treatment emphasizes that preppers are normal people who do normal things in anticipation of normally foreseeable possible problems. We don’t even use the term prepper (with or without scare quotes) in the headline or lede. For a complexity of reasons, most mass media have little interest in fairly and properly covering the subject of prepping (see our article ‘Why the Media is Biased Against Prepping‘ for an explanation why). Not only do they have little interest in providing a fair explanation of the subject to their audiences, some media outlets actually and actively seek to make fun of prepping and preppers. If you are approached to be featured in a media item about prepping, you need to be careful not to unintentionally help the media perpetuate the negative stereotypes they often seek to portray. For more information on how to avoid being tricked into helping the media paint preppers as strange unusual people, please see our articles on what to do if approached by the media (they appear in the linked category). Well it seems pretty obvious: they (the media, and the powers “behind” the media) want to paint Preppers with the same broad, cartoonish strokes with which they portray all Christians as “far-right wackos” and unbending adherents of cult-like beliefs. How ironic, considering that if things do go south to the point where one would actually need those stored up supplies, you know those people that mocked the loudest will be the FIRST ones to insist that they are “owed” a “fair share” of anything those “wacky Preppers” have stored up! I completely agree with everything you say. Alas. Thanks for adding your thoughts to the discussion. I’ve read in some places that the term ‘prepper’ is now starting to suffer the same negative overtones that now apply to ‘survivalist’ and some people are now talking about ‘self reliance’ rather than prepping. But if we keep changing our name, we’ll never win public support; we’ll just confuse people and have them thinking ‘Oh, they’re another group of weirdos, the same as survivalists and preppers’. I think we need to make a stand and fight for a positive image with our current chosen appellation of ‘prepper’ and encourage the public to understand what prepping is, who preppers are, and why it is a good not bad thing.